All it takes is two quick emails from you! 1. Click here to help Whitefish Legacy Partners urge the State Land Board to approve Montana Dept. of Natural Resources and Conservation’s (DNRC’s) implementation of Partners’ trails, recreation and land licenses north of Highway 93 - with the blessings of the City of Whitefish! a. Support Whitefish Legacy Partners trails, recreation and land licenses south of Highway 93 in the Spencer Mountain area. b. Establish clear criteria and standards for determining which previously unauthorized â€œfree-rideâ€ bicycle features will be removed, retained or reconstructed to protect public resources and public safety on Spencer Mountain. We feel this is an opportunity to support a well-organized effort to ensure multiple uses of public trails are compatible with one another. Click here to read Swan View’s letter to Mr. Poncin. Click here to see Mr. Poncin’s letter and map inviting public comment on management of the Spencer Mountain area. 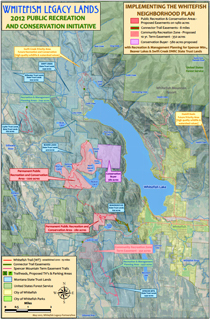 Click here to see a larger version of Whitefish Legacy Partners’ map of its overall project. Click here to read the Daily Inter Lake’s article describing how the several parts of Partners plan fit together.